When it starts getting cold outside, it’s nice to come home to a warm meal. I love a good combination of fruits, vegetables and nuts and although I could just add those to a simple salad, I like to mix them with warm cooked grains in the winter. Quinoa is a great source of fiber and protein and will give you energy during this cold winter. 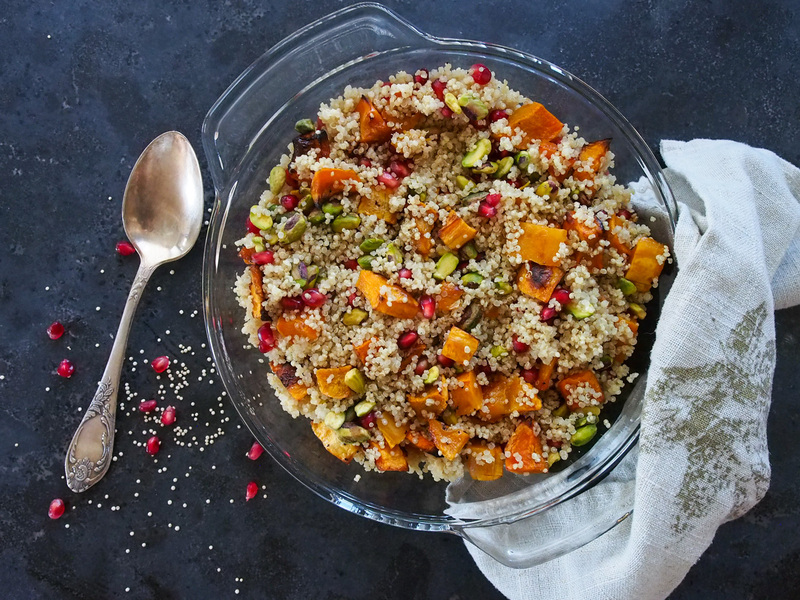 Not only is this dish extremely healthy but I also just love the squash, pomegranate and pistachio flavor combination! Preheat oven to 425°F or 218°C. Peel butternut squash and use a fork and spoon to remove seeds and stringy part. Chop into small bite-sized cubes. In a large bowl, toss chopped squash with 1 tbsp. of olive oil, salt and pepper until well coated. Spread them onto the baking sheet and roast for 35 to 40 min. Toss them over halfway through to ensure they roast evenly. In the meantime, cook quinoa in 2 cups (500 ml.) of water for 15 minutes, until water is evaporated. The quinoa should be fluffy. Heat 1 tbsp. of olive oil in a skillet over medium heat. Cook the onion for 9 minutes until translucent. Add the cooked quinoa and mix well. Cook for another 3 – 5 minutes. Stir in the roasted squash and cook for another 2 minutes. Remove from heat and then add in the pomegranate seeds, parsley and pistachios.